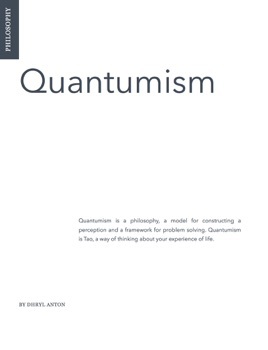 Quantumism is a post-humanistic philosophy, a model for constructing a perception, a framework for problem solving, and a way of thought, or Tao. This Book is a treatise on the philosophy of Quantumism. It is a comprehensive attempt to cover all the core assumptions. Quantumism is not the typical empirical scientific abstract that can only be manifested in theoretical terms. Neither is it a repackaged new age gimmick aimed at an esoteric geek subculture. These ideas represent a fundamental change in the way we define about the experience of life. This has a profound potential to change everything. The quantum leap inherent in Quantumism is it's elegant simplicity, in presenting a cohesive definition that makes a practical contribution to the quality of your life.